Our 2-3.5TRA-3RCA-* is a 3.5mm Jack to 3 RCA with Red, Yellow and Black with gold connectors. 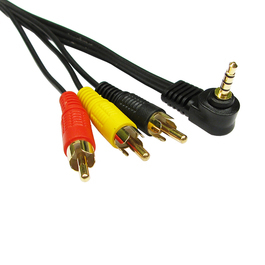 This cable is used where equipment has combined audio and video signal through a 3.5mm jack. Some examples of this would be camcorders, digital cameras and media players. The gold contacts provide a high quality look finish while providing anti-corrosive properties.